Now, this is a project I’ve had in the works for quite some time… It started out simply as a clever way to read Twitch chat whilst doing my professional imaginary spaceship pilot gig, without taking my eyes off what I’m doing, but I believe it has a lot more potential. 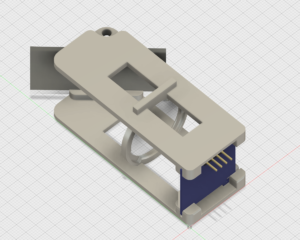 I don’t quite know why I didn’t gain traction with it the first time around, since it only took me an afternoon to come up with a working proof-of-concept from nothing… Though I think maybe I wasn’t quite as comfortable with Fusion360 then as I am now, to design the 3D-printed test fixture. 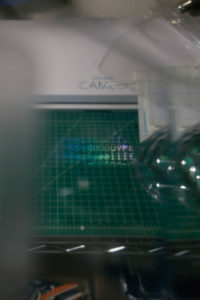 The operating principles are simple enough; the image from an OLED display is focused by a lens element and then reflected onto a transparent surface in front of the eye. So it wasn’t hard to design the test fixture, complete with an adjustable lens, because I wasn’t entirely sure how focal length worked in this scenario. Fusion360 assembly of the test fixture. Thank Science for 3D printing! I ran my usual Ideate→Create→Iterate cycle, turning the initial rough idea into a 3D print, then almost immediately doing it again because something isn’t quite right… Then another because I’ve improved the design… And then yet one more because I want to try a different approach… So on, and so forth. 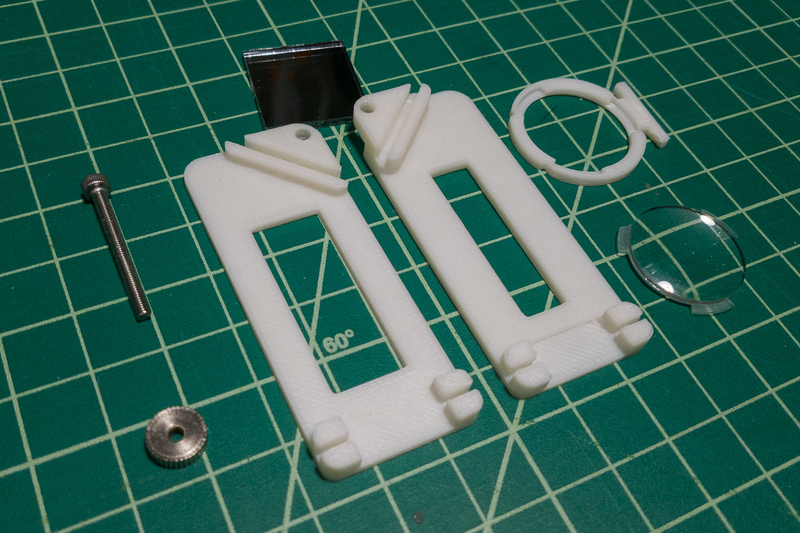 The (final) prototype’s mechanical components. Bits to Atoms: The 3D-printed test fixture. 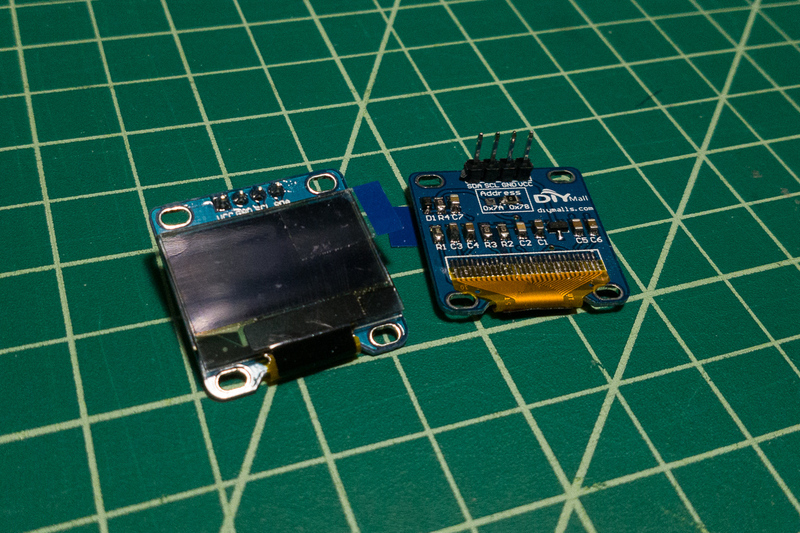 I love these little OLED displays… They’re surprisingly good at displaying tiny text, which is perfect for this application. 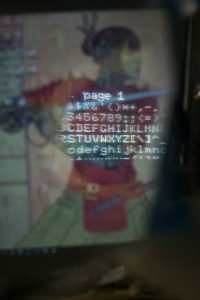 Sadly 128×64 in a 0.96-inch monochrome display seems to be about the best I can do for pixel density versus pixel count. 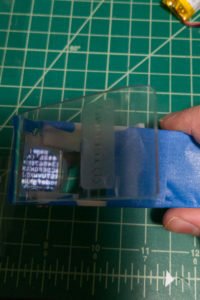 You pretty much have to choose between more pixels further apart, or less pixels closer together… Can’t really find anything like the tiny 640×480 full-color display Google used in the Google Glass headsets. These displays, at least, are very common jellybean parts, and I’ll be writing a more detailed post on them very soon! They’re available in both SPI and I²C bus flavors, though I prefer the I²C interface because it only requires two data lines (SDA, and SCL, i.e. DAta and CLock) and VCC/GND supply lines. After an interface, the next consideration is how exactly to go about talking to it in my program. I found a fantastic library called u8g2, which is the second version of U8glib. The variety of fonts available is mind-blowing! It can also pretty easily draw graphics, not just text. 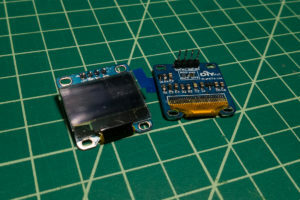 The ‘standard’ 128×64 pixel SSD1306-based OLED display, I²C version. One of the test patterns from the sample code, being displayed on the OLED. For these initial tests I was using an Adafruit Feather Bluefruit, ATMega32u4-based Arduino board with on-board Bluetooth Low Energy, and a little LiPo battery connector and charging circuitry. 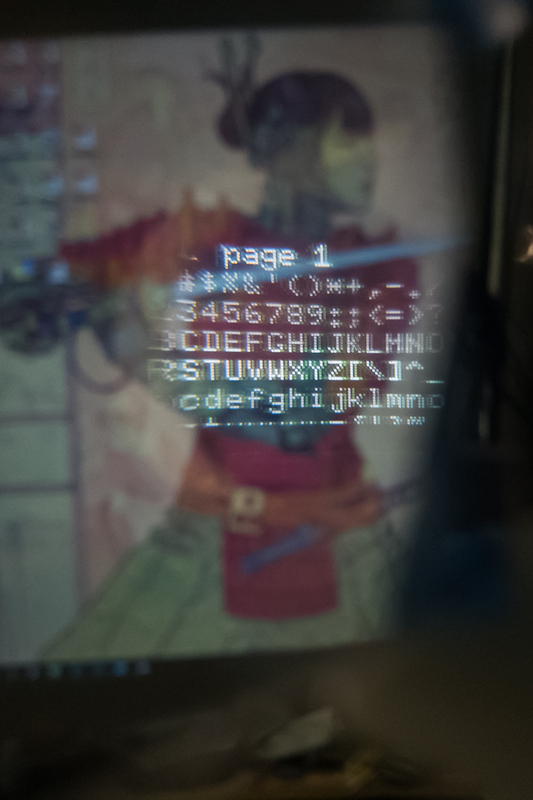 I quickly ran into what was going to be the major limitation; the basic “Hello World!” program I had for the display, in English and Chinese, took up 105% of the available program space, because it needed to load the Chinese font into memory along with the libraries. 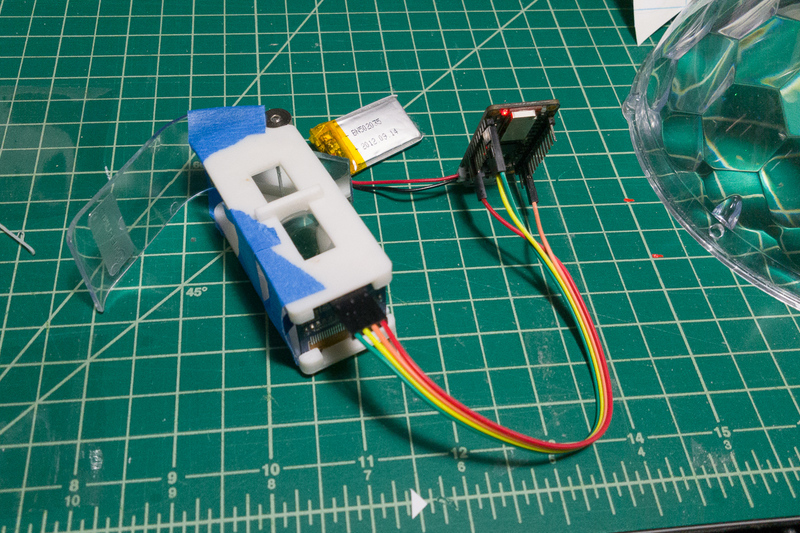 With the electronics more or less figured out, there was more about the physical construction that needed work. 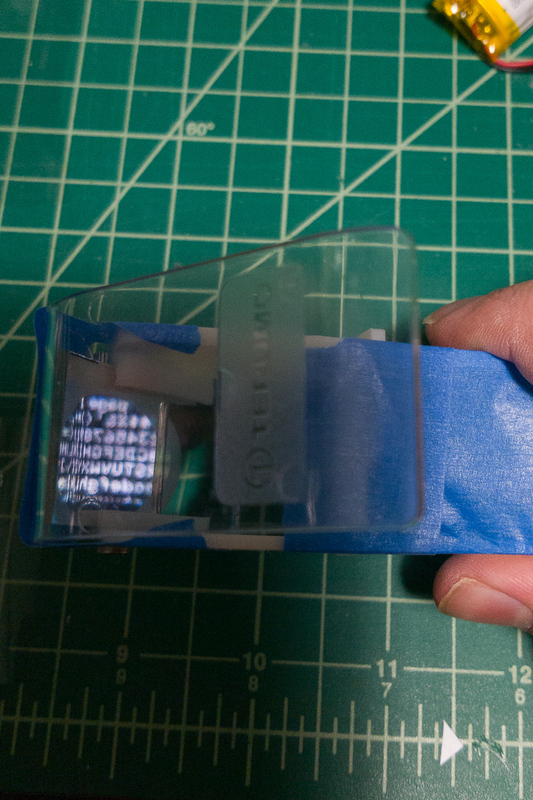 I used a couple 1″ square mirrors that I picked up a bag of on Amazon, and a 25mm biconvex lens for a Google Cardboard… But for the imaging surface, all I had was this piece of literal plastic trash that I’d been holding on to for this specific application because it looked like it would do…. The display’s reflection in the mirror, as seen from the ‘outside’ of the ‘eyepiece’. 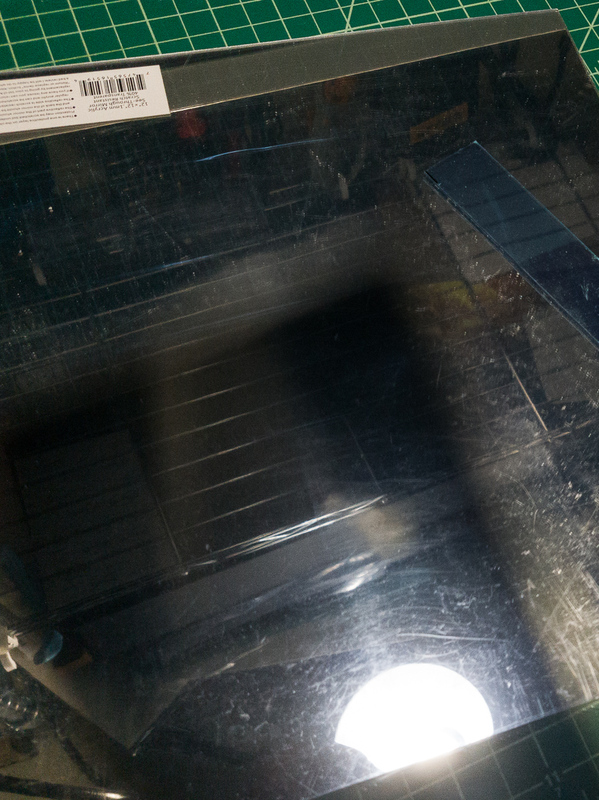 The first time I had this idea, I knew I was probably going to have to use some one-way mirror tinting film or something… This time I actually managed to find some one-way mirror acrylic, specifically some 1mm thick sheet, scratch resistant… It wasn’t particularly cheap—just over twenty bucks with the added overnight shipping —but it was definitely what I needed, as it is highly reflective, giving a perfect mirror finish when the protective film is removed, and fairly easy to see through…with probably only a 10-15% loss of light transmittance at most. 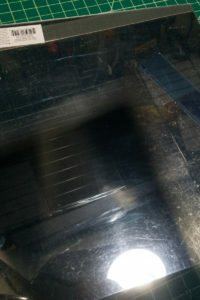 The one-way mirror acrylic, as seen partially through a piece. 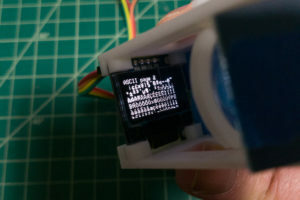 That’s it for Part 1… In Part 2, we’ll look more at the ESP32, examine some alternative optical strategies, and various other tomfoolery.